What is this running on? Permalink Submitted by vieuxnez on December 2, 2007 - 10:04am. and is this official Apple software? Where did you get it? Permalink Submitted by mmphosis on December 4, 2007 - 8:28pm. I Googled, a bit more, I think that the Xerox computer I saw was running Smalltalk. Also, think that the Xerox "mini" computer or workstation cost more than the more affordable $10,000 Apple Lisa. It was a long time ago, what I think I remember and what I actually saw are probably different, human memory being what it is. Permalink Submitted by moosemanmoo on December 4, 2007 - 2:40pm. Ah, yes, Andy Hertzfeld and Bruce Horn's 1982 Finger prototype. Apparently these files are draggable, and a later prototype with folder icons influenced the design of the Lisa filer (which we are much more familiar with). 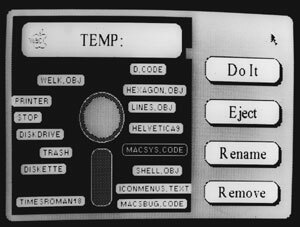 It makes me wonder: if Apple had decided to go with this system, what would be the logical extension of it today? The only other GUI software in 1982 was VisiOn, which was another GUI without a desktop metaphor. I can't imagine it. Permalink Submitted by mmphosis on December 4, 2007 - 7:27pm. The only other GUI software in 1982 was VisiOn, which was another GUI without a desktop metaphor.